There are many levels to instruction, coaching and training. You may specialize in teaching novices how to ride and handle horses. You may work with advanced riders and horses to prepare them for high level competition. You may teach people how to instruct students and train horses. Teaching students and training horses are usually crossover activities even for those who claim to offer one or the other. At some point, an instructor will get on a horse to assess its behavior, responsiveness, and perhaps try to correct it. At some point, a trainer will instruct the owner how to ride the horse. Both may coach riders and handlers at shows and events. Perhaps the greatest concern for instructors, coaches and trainers is the potential for an accident to happen that causes injury to a student, bystander, or horse. You worry that you may be sued or otherwise have a claim made against you for bodily injury or property damage. If sued, you may need to hire a lawyer to defend yourself. If found negligent, you would likely be responsible for the cost of the claim. Instructors, Coaches and Trainers have a strong need to be insured for their activities and exposures to liability. This is because your business services are fairly high risk and provided in a unique way. At Ark Agency, we provide high quality horse insurance plans for owners, trainers, etc. to ensure you and your business’ protection. The level of liability risk is fairly high because students and horse owners can become injured while learning new skills and handling different horses. The exposure is greater if the instructor is providing a lesson horse or teaching someone to ride or drive a horse at an early stage of training. The uniqueness comes from several factors. You likely perform some or all instruction and training services both at and away from your business location, sometimes in unfamiliar facilities and environments. Instructors may borrow or “rent” a school horse for hourly use in exchange for a fee, lessons, or board. So you should be concerned for your financial protection and responsibilities toward those you serve. Fortunately much concern can be relieved when you buy a COMMERCIAL GENERAL LIABILITY POLICY [GL] to insure your instruction, coaching and training activities. If you are an Independent Instructor – Trainer who operates at various stables you do not own, go to Independent Contractor Horse Riding Instructor – Trainer Liability Insurance page on this site for more information. Qualified Instructors and Trainers also have a Professional Liability exposure. The more you know and the more you present yourself to the public as an expert, the higher your Professional Liability exposure will be. Most insurers do not provide this important coverage, but we are able to provide Professional Liability Insurance on your general liability policy by endorsement, and there is a separate nominal premium charge for it. Horse trainers also have a Care, Custody & Control Liability exposure. 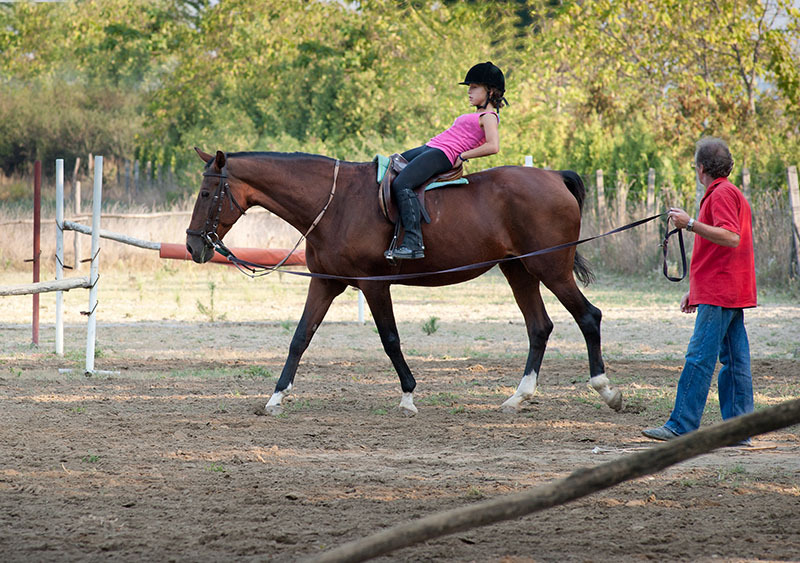 This is because a horse in training may become injured or sick while in the trainer’s care. The trainer could be held liable for related expenses, and be required to pay for the horse if it dies. Instructors who teach on non-owned school horses they borrow may have this exposure too. We are able to offer this coverage by endorsement on your GL policy, and will quote it to you if you complete the Care, Custody & Control section of the application. This horse trainer insurance coverage is optional and there is a separate nominal premium charge for it. Note that non-owned horses cannot be covered this way if they are leased by you. When you lease a horse you become its temporary owner and this situation requires the horse to be insured for loss and injury by a Horse Mortality and Major Medical Insurance Policy. How Risky is Horse Instruction, Coaching, and Training? Moderately High. Horse activities are reasonably safe compared to many other activities people participate in. Yet, horse-human activities do have inherent risks. Accidents do happen when people at different stages of capability attempt to touch, handle, train, ride, drive and control large animals that are unpredictable even when well trained. And some horse-human accidents are serious. Even with the best of intentions and management practices, anyone can have a claim made against them and be sued. Medical Expense: Pays for a claimant’s low cost medical expense with few questions asked about your liability, responsibility or connection in the matter. Settlement or Claims Costs: Pays bodily injury and property damage claims for which you are held responsible. Your insurance needs are unique, therefore we believe in person to person service. Call or e-mail an Ark Agency Representative for an estimated premium, policy and company details, and qualification requirements for our horse insurance. We work with several insurance companies and rates and coverage conditions vary. We will help you determine which application to use and advise on how to put horse insurance in force.